9466 The Crazy Scientist and His Monster is a Monster Fighters set released in June 2012. The set includes a stylised light blue car with two mismatched flick-fire missiles on the roof, as well as a trans-neon green flick-fire missile on the side of an extending platform for Dr. Rodney Rathebone. The car also has concealed hind wheels, 'jets' for speed, a radar dish attached to the roof. The Crazy Scientist's lab consists of a small jail, a rack of tools, a moving platform, and a tower with a laser. The jail cell is where the scientist put Monster Fighters who get in his way. It has a wall which can be pulled down using a chain that can be attached to a pin on the back of the car. On its roof is a catapult for launching trans-neon green 1x1 rounds, perhaps intended as chemical-filled test tubes. The tool rack is a long rack filled with scientific materials such as a conical flask and a glow-in-the-dark skull in a beaker. The laser on the tower lights up, and is used by the scientist to to bring the Monster to life. The set includes 4 minifigures; The Crazy Scientist, his Monster, Dr. Rodney Rathebone and Major Quinton Steele. Monster Fighters, Dr. Rodney Rathebone and Major Quinton Steele, attempt to take the Moonstone from on top of The Crazy Scientist's laboratory before Lord Vampyre does. Meanwhile, The Crazy Scientist brings to life his creation; The Monster. 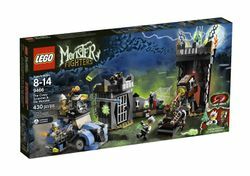 This set includes a light brick to show an effect of lightning fired at The Monster. Even though the lab is underground the box art shows it in a castle ruin. Originally, this set was going to include Jack McHammer instead of Major Quinton Steele, as The Monster is Jack McHammer's Monster arch-enemy, but at Toy Fair 2012, it was shown with Major Quinton Steele, and was confirmed to be the Major, maybe due to the fact Jack McHammer has already faced him according to his bio video. This set arrived later than the other Monster Fighters sets. It is unknown why. This is a description taken from LEGO.com. Please do not modify it. (visit this item's product page) Defeat the Crazy Scientist and his Monster at the laboratory! Dr. Rodney Rathbone and Major Quinton Steele have stumbled upon the Crazy Scientist's laboratory. As our heroes reach for the moonstone, the dastardly scientist zaps his ghoulish monster and brings him to life! Can they escape to their car or will the Crazy Scientist's Monster win the battle and imprison them in the laboratory? You decide! Includes 4 minifigures: Rodney Rathbone, Quinton Steele, the Crazy Scientist and his monster. Zap the Monster to life! Launch a rooftop catapult attack! Zap the Monster with the light brick! Facts about "9466 The Crazy Scientist and His Monster"
Defeat the Crazy Scientist and his Monster at the laboratory!